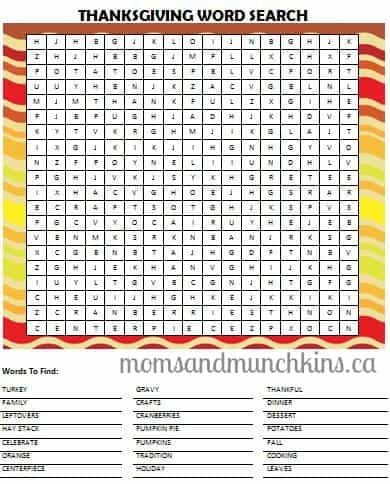 This free printable Thanksgiving Word Search is a fun activity for the kids in anticipation for the upcoming holiday. This could be included at each place setting of the kids table at your Thanksgiving party. Heading to a family or friend’s home for Thanksgiving supper? You could also include this printable in a hostess gift basket as a little fun game for their kids. Need a quiet activity to keep the kids busy while you put the final touches on that delicious turkey dinner? Then give this freebie a try! Turkey, Gravy, Thankful, Family, Crafts, Dinner, Leftovers, Cranberries, Dessert, Hay Stack, Pumpkin Pie, Potatoes, Celebrate, Pumpkins, Fall, Orange, Tradition, Cooking, Centerpiece, Holiday, Leaves. What other words remind you of Thanksgiving? Let us know in the comments below. Does your family have any fun Thanksgiving traditions? Dishes that you always make for dinner? Afternoon activities? A fun craft for the kids? Special places you visit? Let us know about them in the comments below. The one thing we must have each year is pumpkin pie. It just wouldn’t be the same without pumpkin pie and whipped cream, right? For my husband, it’s all about the mashed potatoes and gravy. Looking for more Thanksgiving fun? Try this free printable Thanksgiving Scavenger Hunt and Thanksgiving Word Scramble. For more fun ideas for the holidays including party ideas, free printable games, activity ideas and more – visit our special Thanksgiving page. We’re always adding new ideas for family fun and we’d love to have you join our rapidly growing community on Facebook, Twitter, Pinterest or our new RSS feed Bloglovin’. Very cute!! Thanks or sharing! Perfect for keeping the kids entertained. This will be a plane activity tomorrow for sure! This will work for us next year when my boys know how to read! Awesome! We always have a family and friends gathering for Thanksgiving – our largest for the year. Thanks for sharing this printable with Afterschool! I’m still working at Thanksgiving traditions – our meal gets simpler each year as we add more kids to the table! Some day I’ll have more time to go “all out.” 🙂 Thanks for linking up this printable to After School! WOW! I googled Thanksgiving games and activities and you were at the top of the google list and now I see why. We are having a family reunion Thanksgiving Dinner at the Church Fellowship Hall and your Thanksgiving Word Search and Thanksgiving Word Scramble is just the perfect game to engage the family including the children so they’re not running all over the place. Thank you for the excellent games and activities ideas. Thank you so much for your sweet comment, Shannon!